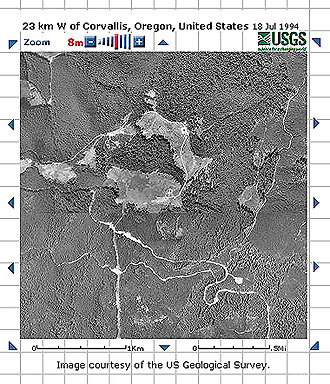 Compare terrain contours with aerial photos. Marys Peak qualifies as an epic ride from Corvallis. It's a 52-mile roundtrip from the Willamette River to the 4,097-foot summit. Most riders prefer to drive to the mountain and begin their rides from Conner's Camp or the Observation Point parking lot near the summit. Designated trails are open to mountain bikes from May 1 until October 1. Trails are closed during the rainy season. There isn't enough traction for climbing and decents could be dangerous. 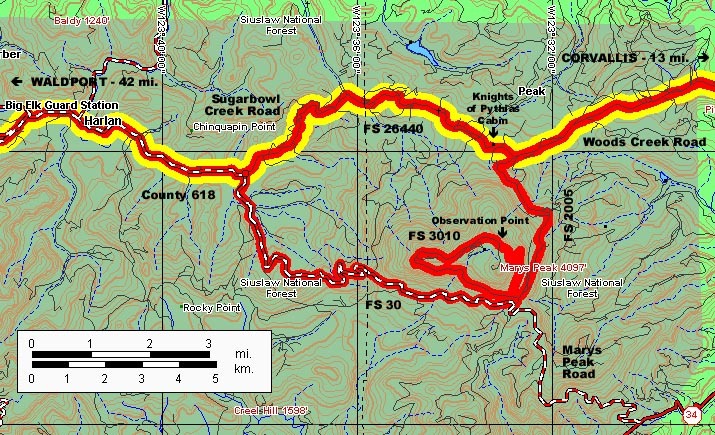 provides access to the trails on the north side of Marys Peak. Drive (or ride) 1.8 miles west of Philomath on U.S. Hwy 20 to Mile 48 and turn left. The first couple miles are paved, then a potholed gravel road continues to climb to an elevation of 1,700 feet 7.4 miles from the paved highway. FS 112 continues over the north shoulder of the mountain to the Knights of Pythias Cabin site. Watch out for traffic. skirts the City of Corvallis Watershed as the gated access road climbs on doubletrack to Conner's Camp at 2,560 feet over 3.4 miles. is a moderate climb or a technical descent. It climbs 1,200 feet in 2.7 miles to the Observation Point parking lot. It's a beautiful ride through stands of old-growth Douglas-fir, noble fir and western hemlock. is difficult and exposed. 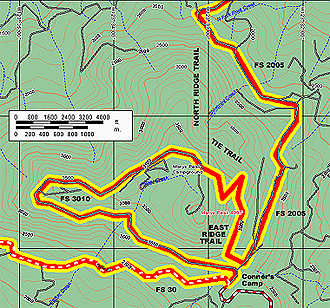 Relatively short at 1.1 miles, it connects the East Ridge Trail with the North Ridge Trail, 0.7 miles below its crest, with some rocky and unrideable sections. Many experienced riders walk across two exposed cliff traverses. switchbacks 3.7 miles losing more than 2,000 feet before it connects with the gated road at the Junction of Woods Creek Road and FS 112. Rocks and roots make serious obstacles. Avoid this trail in wet and muddy conditions. winds around and switchbacks up the west side of Marys Peak as it climbs 4.0 miles from the Conner's Camp turnoff to the Observation Point parking lot at 3,760 feet. Watch out for traffic climbing or descending. continues west to its junction with Sugarbowl Road and County 618 before reaching Harlan, 13 miles away. It's all downhill from 2,560 feet to 319 feet. Watch out for vehicle traffic. 4. Always yield the trail. Nothing ruins a great trail ride like a wreck or a mechanical breakdown miles from home. Even in summer, weather in the Coast Range can change quickly. It's often hot and sunny in the valley, but cold onshore winds, thick clouds and rain can spill over the ridges without warning. Marys Peak riders should be prepared, especially for changing weather in the afternoon. Marys Peak can be a day-long ride or a very long walk. Having a bag of bike tools won't solve a problem miles from anywhere unless the rider knows what to do (and) or carries one of the convenient seat bag fixit guides. Park Tools presents an excellent online primer for Bike Repair and Maintenance and the Great Outdoor Recreation Pages offer sound advice on Bicycle TLC. Dennis Coello, the editor of the America by Mountain Bike series of guidebooks published by Menasha Ridge Press including Mountain Bike! 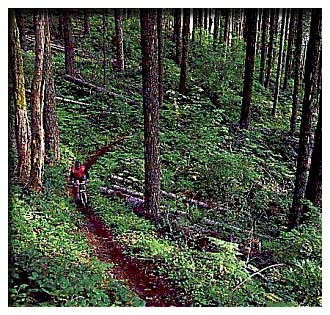 Oregon A Guide to the Classic Trails by Laurie and Chris Leman, explains how to be Ready for the Worst. Marys Peak is a challenge for bikers and hikers, but its mysteries puzzle biologists, etiologists and geologists as well as editors who'll search for a missing apostrophe and discover some curious history. Mary's Peak would conform with proper English punctuation, and so would Marys' Peak if more than two Marys were the source of the name. But historians can't agree on the exact origins of the name for the Corvallis skyline's dominant peak, a small river, or even the origins of the town's name. Scholars from the South Park school would just blame Canada, and they'd probably be right. French Canadian trappers for the Hudson's Bay Company referred to the mountain as Saint Mary's Peak and identified the small tributary of the Willamette as Mary's River when they trapped beaver and other furry critters hereabouts in the 1830s. Pioneer Joseph C. Avery claimed the land at the confluence of the Willamette and Marys Rivers in the early summer of 1845 at the end of his arduous trek from Illinois on the Oregon Trail. In 1847 he opened a general store and began a ferry service across the Marys River, but left for California's Gold Rush in 1848-49 like many new Oregonians. He returned and platted a townsite that became known as Avery's in January 1850. He changed the name to Marysville on Sept. 9, 1850. But some confused the tiny Oregon hamlet with the metropolis of Marysville, California, the "Gateway to the Gold Fields" about 50 miles north of Sacramento which boasted a population of nearly 10,000 by 1853. By contrast, the 1850 Benton County census identified only 814 residents in an area that included the present county and all of Oregon west to the Pacific Ocean and south to the California border. Some historians believe the river, the town and the mountain were named for Mary Lloyd, the daughter of 1845 pioneer John Lloyd (from Clay County, Missouri), who became the first white woman to cross the river. Harvey Scott, the legendary editor of The Oregonian in its weekly and daily forms from 1865 to 1910, identifies one Adam E. Wimple, formerly of Oneida County, New York, as "the earliest actual settler" of Corvallis. Scott says Wimple named everything for a sister who never visited Oregon. "I will make my sister's name known forever," he is quoted as saying. Few historians note that same Adam Wimple was hanged Oct. 8, 1852 in Dallas, Oregon for the August 1st murder of his wife -- Mary. Meanwhile, businessman J.C. Avery, whose name would be attached to his store, the ferry, the first post office, a dam, millrace, sawmill, gristmill and the city's first brick building among other things, sought introduction of a "Bill to change the name of Marysville to Corvallis" in the territorial legislature on Dec. 20, 1853. At the same time, 56 residents of Salem petitioned the legislature to change the name of Salem to Corvallis if the Marysville change wasn't approved, writing: ". . .it is to the minds of your petitioners appropriate, inasmuch as it is the most proper name for a town of this valley." Conventional wisdom makes Corvallis the "Heart of the Valley" as a combination of the Latin words for heart and valley. But there's a small problem. Valles is valley. That's the easy part. But the Latin word for heart is cardiacus. Cardiacus + valles just doesn't have the panache of subdivision-sounding names that sell real estate and invite investors. Corazon is Spanish for heart, and that sounds and looks better, friendler and more inviting than a medschool mouthful that vaguely hints at something that's painful to look at, say or experience. Cordicitus is an adverb that expresses emotion, from the heart. Circumcordialis describes things around the heart. But Corvallis was a frontier town, and the Whitman Massacre and first Indian War were fresh nightmares. Another was coming. Corvus is Latin for Raven, the ubiquitous black birds that were the bane of homesteaders and the source of legend for Native tribes across America and throughout the Northwest. Vallum is a Latin word Roman engineers used to describe fortifications, palisades, ramparts or earthen walls. Convallis describes a valley enclosed on all sides. So which is it? Heart of the Valley? Ravens Fort? Or just a common typographical error that substituted an "r" for an "n" and transformed a classic geographer's description of a location into a place name? Take comfort in the fact Asa J. Lovejoy lost a coin toss to his business partner, Francis W. Pettygrove, in 1844. The Rose City took its name from Portland, Maine instead of Boston, Massachusetts. Pettygrove left Portland and in 1852 became a founder of Washington's Victorian Seaport of Port Townsend. Salem has nothing to do with witch trials unless actions or inactions by the legislature are being taken into account. The name is a transliteration of the Hebrew word shalom meaning peace which was chosen by the city's missionary founders. And Waldport? That's easy. The town was founded by German immigrants who began shipping logs and lumber from their forest port, wald port. For more historical sources, visit 19th Century Bicycle News. See The Bicycle & The West for a comprehensive listing of Oregon cycling links and online resources.